As we approach one of our last top 6 extraordinary theme of the month contests for 2010, we see some true talent for theming. Whether you are looking at this months winner Absolute HD or Eternal by BlueMetal, you can see just the amount of work that these theme developers put into their themes! Remember there is only one more month to get your theme entered in the iJailbreak exclusive awards; for your chance to win $100. Make sure you enter your theme before its too late! As always, Congratulations to all of you, who made it on this months Top 6 Extraordinary themes of November. Absolute HD, is one of those themes that you can only comprehend, when you actually install it on your iDevice. To be honest, I have never seen such a complete theme before that actually looks extraordinary on your iDeivce! Absolute HD contains a super slick red and black styled UI, that includes a fully skinned MediaPlayer, Dialer, Calculator and much more. This is one theme that truly deserves a place in the iJailbreak Hall of Fame. In this months iJailbreak Exclusive Awards we see some themes that truly go above an beyond the title of a theme! With theme’s like AbsoluteHD, iPhone 7 Black, and Metro IV – you can truly see some themes that change the way you view your iPhone. With so many extraordinary themes, it was a very hard decision for this months theme of the month. However, once we saw Absolute HD by viiolent.HD//, we were blown away, and knew who would win this months iJailbreak Exclusive Award. Congratulations also goes out as well to all the other themes that made it into this months top 6 extraordinary themes of November. Please make sure you take a look at the top 5 runner up themes that made their way into this month’s Top 6 Extraordinary Themes of December. 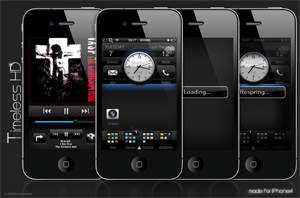 Heavy Metal HD – created by Storyr combines a unique idea, with the practicality of a well designed WinterBoard layout. Heavy Metal HD features Auto Skinning App Store icons, Unique weather and date widgets, and much more! 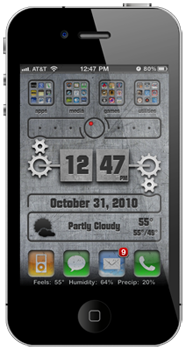 This is one theme that will truly spice up your iPhone, or in this case… Metalize it! 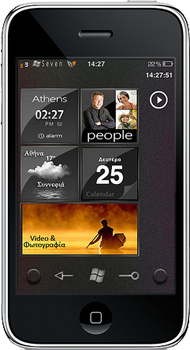 It is no doubt that with the release of Windows 7 Mobile, came a lot of inspired themes to replicate Windows7 Mobile on the iPhone. In my opinion, iPhone 7 black has done one of the best jobs at replicating Windows Mobile 7; while providing a unique flare of its own at the same time. If you are looking for a truly impressive theme, the iPhone 7 black theme is for you! Sometimes the best themes come out of modded themes! Originally created by BlueMetal; iBlack Mod was actually created by Reeco and just by looking at the screenshot you can tell that this theme designer has some serious talent! Not only does theme provide some very useful widgets for displaying favorite contacts and new facebook news, this theme looks amazing! What are you waiting for? When you look at Eternal, created by Raptors; the first thing you think of is Wow! The theme is not only extremely sleek, it is extremely extraordinary. Every element of your iDevice’s UI, is instantly themed with brilliant artwork including the – LockScreen, MediaPlayer and much more! This is one them that you can truly show off to your friends. When I first saw Timeless HD by BlueMetal, I was truly lost for words! In fact I am still lost for words with this masterpiece of a theme. Every element contains beautifully handcrafted HD elements, that will truly revolutionize your iDevice. What more is there to say? You need to check this theme out! This months top 6 extraordinary themes contained some tight competition, and some truly extraordinary themes! We are quickly approaching the end of the year, and with 2010, heading to an end, we are getting ready to announce the top theme of the year! There is only one month left, for your theme to get entered in to the iJailbreak Exclusive Awards, so act now. These were the top 6 Extraordinary themes of November 2010, If you are interested in submitting your theme to the Top 6 Extraordinary themes of December, contact me. Yeah iPhone 7 black does look pretty cool!